This Friday is a perfect opportunity for horse betting online players to place some Kentucky Derby future bets. We’re still amidst the road to the Kentucky Derby, but the early high odds on horses make placing future bets highly appealing. Let’s take a look at some pertinent information for this year’s Kentucky Derby before going over some parlay betting tips. His name an allusion to legendary Olympic champion and multiple world record-setter @usainbolt. Player looking to place some bets this weekend basically have two options to choose from. On the one hand are straight win bets and on the other Exacta betting. Right now bettors can place predictions on the Kentucky Derby on May 5th and the Longines Kentucky Oaks on May 4th. Additionally, this will be the first year punters can put action on a Derby/Oaks double. A straight win bet is predicting which steed will come out on top while Exacta betting is choosing the top two finishers in the race. Right now 23-horses are listed as individual wagers with the FIELD starting at 7-2 odds. Bolt d’Oro is one of this year’s favorites facing 6-1 odds. Following d’Oro is another horse betting online favorite, Audible. One of this year’s bets options, Audible comes in with plenty of momentum and is facing 8-1 odds. Promises Fulfilled, McKinzie and Fountain of youth are all pegged at similar odds. If you wish to hold off on making any Kentucky Derby future bets at the moment, you can tune in for some events this weekend that will certainly help you bet on this year’s derby. Specifically, the Tampa Bay Derby and Free Drop Billy provide the perfect opportunity to size this year’s field up. So, what horses should racebook players keep an eye out for this weekend? Bob Baffert, a longtime horse betting online favorite, has trained McKinzie. This instantly makes the horse a great racebook betting option, given Baffert’s esteem reputation. Specifically, Baffert has won the San Felipe event 6 times already. On top of that, the racebook odds McKinzie is facing suggests he’ll get his 7th this weekend. Punters considering backing Kinzie should tune to determine if they like what they see. Lombo will be competing at San Felipe this weekend. This two-year old debuted in the Robert B. Lewis stakes in February and his performance dazzled many punters. Specifically, Lombo was able to win the stakes with a full two-length triumph. 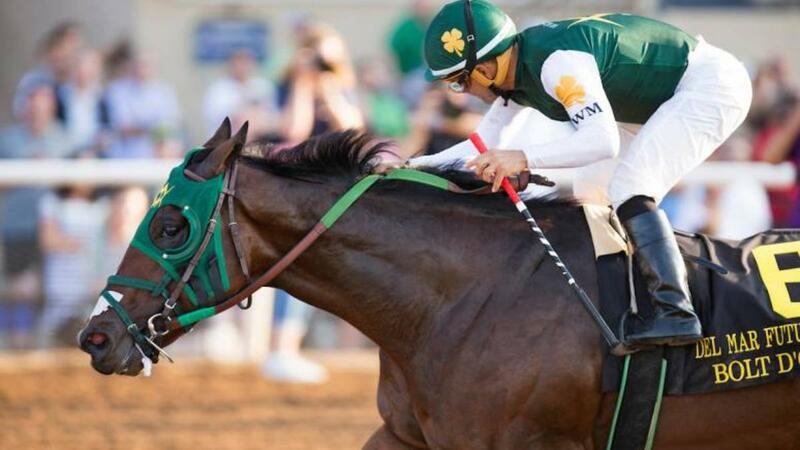 Seeing how he fares in this weekend’s event might convince some bettors to place a Kentucky Derby future bet on Lombo. Untamed Domain will be competing at the Tampa Bay Derby this weekend. Behind Graham Motion’s training, Untamed Domain is a great option for this weekend’s action. Furthermore, he’s a great Kentucky Derby betting option as well.